I Warned You - Martha Mudguts Has Gone Easter Crafting Nuts!!! | Life Love and Hiccups: I Warned You - Martha Mudguts Has Gone Easter Crafting Nuts!!! I Warned You - Martha Mudguts Has Gone Easter Crafting Nuts!!! I did warn you I was gonna go a little nuts over Easter crafts didn't I? I think it is partially an excuse to keep my hands busy and distracted so they don't go grabbing for something to shove in my mouth that I shouldn't be shoving in my mouth, and the other part is my inner frustrated Martha Mudguts desperately trying to come out. So I wanted to make a little Easter canvas to put up on the piano, just to make the house feel a little Eastery - is so a word! This is such a quick and easy little 5 minute project and you gotta love those right? I actually intended it to be something for the kids to make, but they were outside riding their skateboards and I quite frankly got impatient and went ahead without them. But had they decided to haul their energetic little bums inside then this WOULD have been easy for them top do and they WOULD have had loads of fun. I have attached a template for you at the bottom of this post and it is on some sweet Easterish (again is so a word) paper. You could also use the template to cut out some cute material as well, but I thought of that AFTER I had already done this. First of all cut out your template (on paper or material). Next you need to coast your canvas with some Modge Podge or some Elmers Craft Glue. You can get these little canvases for around $5 bucks at those little bargain stores you see everywhere. Now get to work arranging your shapes on the canvas. Give the whole thing another coat of Modge Podge or Elmers. I used a whole punch to pop out some little confetti dots using the scraps of the template and then just dotted them around whilst the Modge Podge was still wet. You can dab a little extra glue over the top to make sure those little suckers don't go anywhere. Finally attach a little pom pom tail with some hot glue. There is a great mini pom pom tutorial here. And that is it. It will literally take you 5 minutes - OK 10 minutes if you waste the first 5 minutes standing in the driveway in you PJs like a crazy cat lady unsuccessfully screaming at the kids to come inside and join you. 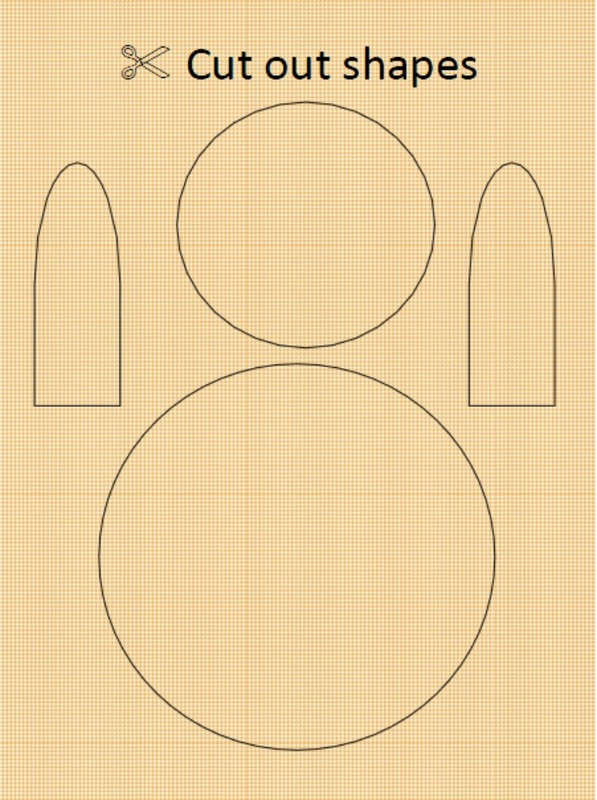 And as promised here is the bunny template or as they say on Martha - Here's one I prepared earlier. Have you Been trying to rope the kids into any Easter Crafting? Do your kids listen to you when you stand out on the street screaming at them to come and play with their mama? Do you still have your PJs on mid afternoon?